The sun sets on the 2018 SCR autocross co-drivers' cars. 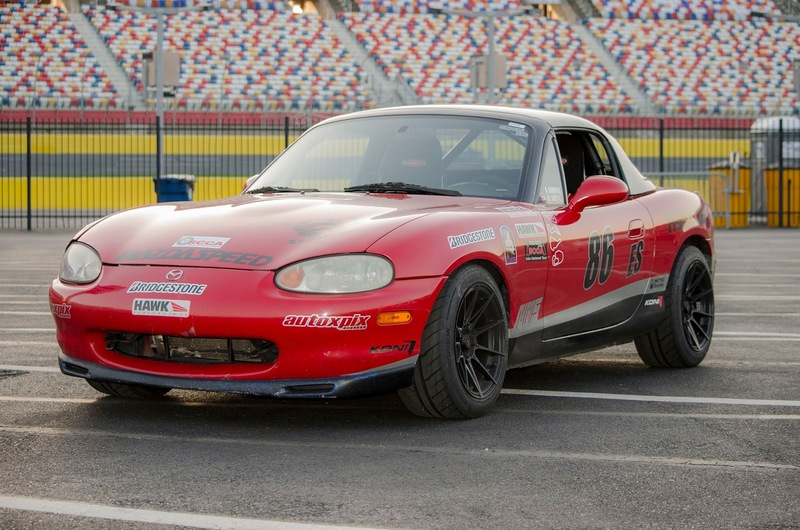 This year's round of SCCA's Track Night in America Program is in swing and I took the Miata up to Charlotte Motor Speedway with a bunch of the usual suspects to get a taste of the high banking and the roval. Yep, the roval is the road course within the speedway that mixes road course left and right hand turns with the main oval track. CMS corner worker looks on as the #86 goes by. 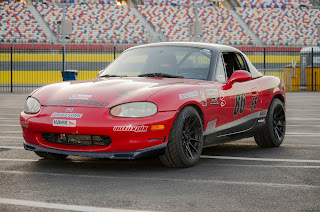 Charlotte has definitely been the most difficult track I've driven. 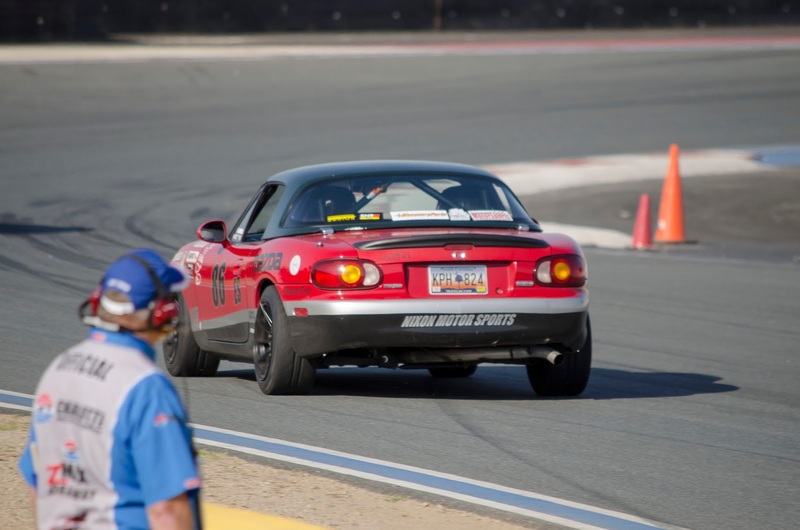 Concrete walls closely line the track at almost all points and with the long straights and banking, the Miata was close to topping out fifth gear. The big banked turns were far from smooth and there were a couple of rough sections that wanted to pull the car right toward the walls. 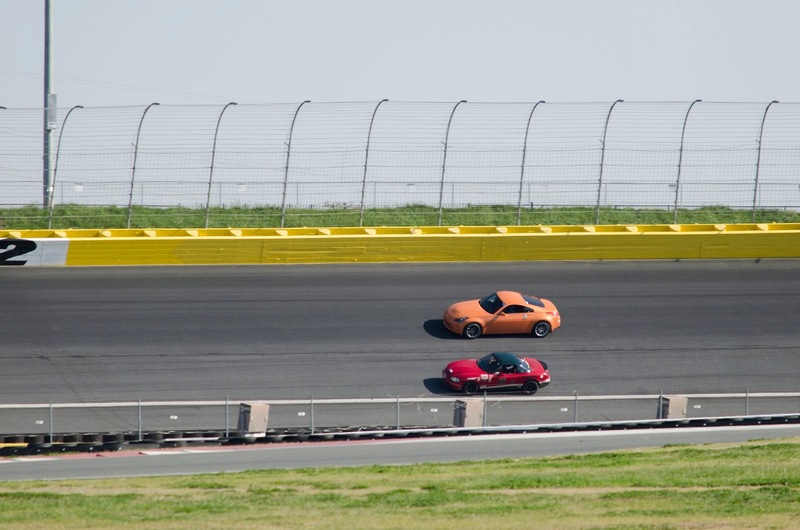 Jason makes the pass easily with his modified 350Z. The guys and I kept calm, kept looking ahead, stayed smooth and avoided any trouble. 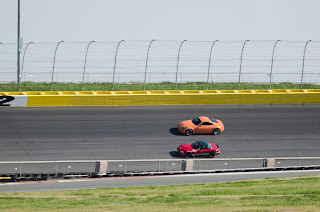 There was a good number of higher powered cars (Corvettes, Porsches, BMW M3s, Oh my), but I managed to keep up with them and sometimes go quicker than them in the twisty bits until they could unleash their power around the NASCAR oval section. My brief glances down showed a sustained 112mph through those banked turns. Each lap I pushed closer to the wall to gain a slight aerodynamic advantage and pick up a few more miles per hour down the long back straight-away. As always, I'm sure I could have driven a little quicker, but the best part of my evening was a brand new Corvette flying past me on the back straight. 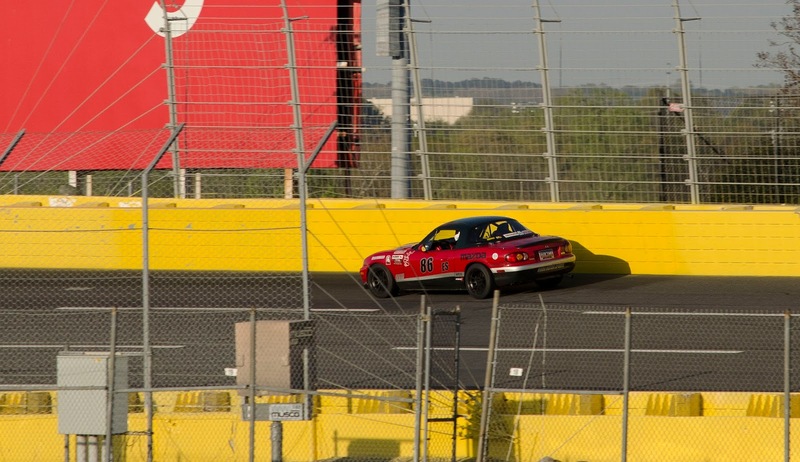 As we entered the banked turn 3 and 4 he was on the brakes and the yellow blur on my right side slowly slipped back behind me again as I kept my right foot planted on the gas pedal. The new tires and wheels on the Miata did a fantastic job and allowed the lightweight Mazda out-grip even the power cars on those super-fast high speed turns. Quick glamour shot with the new wheels and tires. Below are my two quickest laps of the evening as a Porsche 911 slowly creeps away from me and the v8 BMW M3 can't quite outrun me. It was a TON of fun, as always. 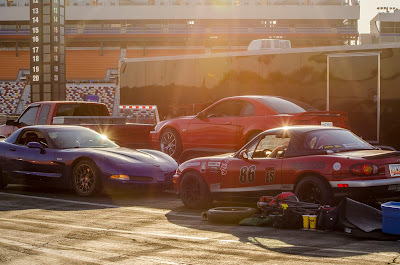 Track Night in America is an awesome, no pressure, totally-fun way to get on a racetrack and drive as quickly as you'd like and feel like an F1 superstar. Check 'em out HERE. MASSIVE Thank You to Alec for hanging out with the guys again and taking all of these awesome shots!